I was attending an undergraduate survey of Canadian History when I first encountered the 1771 story of Samuel Hearne watching in horror as his Dene companions slaughtered a group of Inuit in the Central Arctic. The day’s lecture was focused squarely on the tale’s accuracy, a practice that, according to Emilie Cameron, has a long history within European discussions of the Arctic. Far Off Metal River, Cameron’s fascinating and inspired critique of Hearne’s story, certainly stokes readers’ disbelief, but its purpose is not to disprove Hearne’s account. For Cameron, the story of the so-called Bloody Falls Massacre serves as a way to illuminate how “past, present, and future Norths have been made possible, sensible, and legible” (13). Indeed, even the debates about the tale’s accuracy are fodder for Cameron, insofar as they provide materiality and legitimacy to colonial narratives, and pave the way for Qablunaat (an Inuktitut term meaning, roughly, non-Inuit, non-Indigenous) forays into the North. What becomes apparent early in Far Off is that Cameron seeks to tell a different story about stories. Simply analyzing “colonial discourse” leads to conclusions that “the stories told by Indigenous peoples do not matter,” and study of Indigenous storytelling “tends to name practices and knowledges rooted in the traditional, oral, and local, practices and knowledges whose relations with the complex geographies on the present are often left unexplored” (21). By contrast, postcolonial discourse analysis is necessary but limited, as it tends to overcharacterize colonial texts as entirely and inevitably hegemonic, and overlooks the “messy, material, placed contexts in which colonial relations are continually made and remade” (24). Far Off thus serves to overturn conventional approaches to textual analysis, particularly as it might be applied to studies of the Arctic, not only by offering a range of stories that ‘mess up’ the two-dimensional, fictive relationship between colonizer and colonized often traded in by postcolonial scholarship, but also by carving out space to exalt in its own messiness. Far Off’s preference for messiness over refutation serves an assortment of analyses, particularly in Chapter 2, “Ordering Violence,” which details the relationship between the often invisible violence of settler colonialism and the Bloody Falls story. Oftentimes, scholars discussing colonial accounts of Indigenous violence end up developing an argument based on whose violence is “really” violent – a rhetorical turn meant to reveal how settler subjects are trained to condemn Indigenous violence as “savage” and forgive colonial violence as necessary, but which ultimately fails to disrupt the pernicious savage-civilized binary. Cameron turns her attention, instead, to how the violence of Bloody Falls creates “a subject position from which Qablunaat can witness the suffering of northern Indigenous peoples without feeling involved or implicated in that suffering” (36). So while Cameron nods to the role of the concept of savagery in concretizing the borders of the civilized, modern subject, thankfully – and refreshingly – she is more interested in exploring the complex intertexts between Hearne’s account, its fans and its denouncers, and life in 18th century Britain under the shadow of the French Revolution, when tales of uncivilized lands and its occupants “were ways of making sense of complex political, economic, and social crises in a tumultuous time” (49). Here, an important question arises for the reader: if Hearne’s simultaneous inaction and apparent empathy for victims of the massacre allow for him to “view the event in all its gory detail and yet not be involved” (52 emphasis in original), then how might contemporary Qablunaat – Canadians horrified by murdered and missing Indigenous women, or scholars writing from a position of solidarity, for example – avoid adopting a similarly sympathetic but (supposedly) non-complicit subject position? The main attraction in Chapter 3, “To Mourn,” is, strikingly, a northern flower. While it has no Inuit name, it is now known as Senecio lugens thanks to John Richardson, a “surgeon-naturalist” from the first Franklin expedition, which sought to follow the path into the Arctic beaten by Hearne (64). Cameron scrutinizes the etymology of Richardson’s term and then produces a sophisticated analysis of how the plant functions within a constellation of objects and stories to actualize the Bloody Falls account as something with social and material clout; as something that informs and bolsters a network of “military, political, publishing, and scientific communities in Britain,” which imagined the world through reports by travellers like Hearne (66). Cameron surmises that referring to the plant as lugens – indicating mourning, in Latin – would compel Richardson’s botanist compatriots to “imagine that God’s own grief at the slaying of the Inuit was manifested” in the plant’s black leaves (71). In a sense, the mourning flower, accompanied by gloomy plates and drawings later produced to preserve the event, are proxy witnesses who continue to render the event in tangle form. In Chapter 4, “Copper Stories,” Cameron (re)stories the Bloody Falls massacre to show what Hearne’s story leaves out, making it not a story about Indigenous violence, but a story that is pointedly not about resource extraction. Cameron shines a light on copper’s various roles in the story, such as Hearne’s mention that the Dene searched out Inuit copper during their attack. 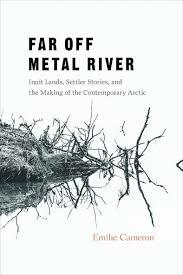 Framing Inuit “as a traditional copper culture,” Cameron argues, is tied to increased industrial extraction in the area (87), as colonizers and developers exploit what they perceive as Inuit transitioning from “traditional” to modern coveters of metal. Cameron makes the enticing suggestion that copper is “good to think with” (89), revealing that Indigenous “co-existence with copper enroll[s] a particular network of things” while Hearne’s interest in copper gestures to “international networks of trade and manufacture” – static between two perspectives indicating the “very different narrative geography within which Hearne operated” (91). Thinking with copper, then, is a way to complicate too-simple stories by situating them within broader systems of resource development. The copper story is tricky, given Cameron’s promotion of particularity and situatedness. It is at once a metonym for stories that we – whoever that “we” is – know, tell, and live, as well as an instance where specific stories exist in particular relation. This will be a challenge for scholars in a range of discipline, who must determine how to extract lessons from Cameron’s investigation without universalizing and totalizing her insights. Cameron challenges prevailing thinking about what resistance looks like in Chapter 5, “Resistance Stories,” directing readers to “geographies that cannot be reduced to colonial power relations nor to the filters of institutional legibility” (141). Cameron turns to efforts on the part of the North West Territories government (GNWT) and the federal government, in the 1970s, to erect plaques in the Central Arctic in commemoration of Hearne’s journey. Attention to the “acts of resistance” that arose in response to the proposed plaques serve “as a diagnostic of power, as a means of troving historical shifts in the intentions and methods whereby governmental, corporate, and religious figures have intervened in the lives of Kugluktukmiut” (113). Cameron does have some use for Foucault, and employs his concept of govermentality to demonstrate that stories, self-government agreements and treaty-making are meant to “reshap[e] the very terms upon which a target population conceptualizes itself, its history, and its future” (119). The settler-colonial state continues to pursue these means, Cameron reminds us, even / especially when the North West Territories government (GNWT) acquired greater power, and even / especially now that Inuit have attained unprecedented bureaucratic leverage with the creation of Nunavut. Despite the challenges faced by Inuit, however, the enduring significance of their stories and practices is never far from Cameron’s consideration. She recalls that Inuit youth who once “used their democratically elected settlement council to resist the erection of plaques commemorating Samuel Hearne and Bloody Falls did so not so much as an exercise in the formation of territorial and national citizenship […] but rather as part of a new strategy for the articulation of Inuit interests” (128). Instead of signalling a full rejection of colonial governance in favour of “tradition,” or evidencing assimilation into colonial order – a troubling dichotomy with no escape – Inuit are working, and have always worked, within current constraints as Inuit as a form of being that must be reasserted on the ground, in the moment. Indeed, Kugluktukmiut’s rejection of the plaques was grounded in “an acute sense of responsibility for the land and for ensuring a successful land claim” (140), suggesting that their actions reveal their understanding of the connection between the plaques and access to land – a conclusion validated by State actors expressing interest in preserving parcels of land as archeologically significant just prior to the commemoration proposals (131). Cameron writes, “From what I understand, remembering and forgetting are expressions of competency in Inuinnaqtun, not an indication of whether traces of story or experience can be recalled” (149). Chapter 6, “Toward an Emerging Past,” expands on Inuit notions of “responsibility as a contextual, relational, and practical orientation to the demands of the everyday, aimed at maximizing individual and collective well-being and survival” (147). Cameron reports, via Kugluktukmiut sources, that certain stories are meant to be told on the land, or at certain times of year (155), which makes space for other stories, and perhaps unseats the types of master narratives that Qablunaat seek to impose. Placing stories also constitutes a “move away from Bloody Falls” as not just “an act of conscious forgetting” but “an active storying of other places” (159). Likewise, Inuit, Dene and Tlicho have met and continue to meet in order to develop new stories in the interest of a shared, beneficial future (167) – a form of engagement that directly contradicts the supposed antagonisms between Indigenous nations that the Bloody Falls story takes for granted. In her final chapter, “Ptarmigan Stories,” Cameron recounts what initially seems like an “Inuit version” of Bloody Falls, with a caveat: this version – like all versions – cannot be read as a “pure” Inuit account of the massacre. Rather, the story “is entangled in Inuit-Qablunaat histories” and as such, actively undermines any interest in “‘pure’ Inuit stories, uncontaminated by past and present relations with Qablunaat” (172). Indeed, it is in this final chapter that Cameron’s own grappling with the constraints of settler scholarship – or perhaps simply being a settler, full stop – becomes clear. She writes, “To seek out Inuit versions of contentious histories, histories over which Qablunaat retain narrative and material control, is ultimately to ask Inuit to perform prescribed roles in maintaining uneven and violent relations” (173). Of course, the pernicious desire for authenticity is a concern that those in the humanities must constantly confront, which is why Cameron’s book will be of great interest to scholars within Indigenous Studies, but also historians, anthropologists, and political scientists, to name a few. Ultimately, Far Off stands as a challenge to all Canadians, but perhaps settler scholars in particular, to develop the analytic and conceptual skills needed to understand how our interests, desires, concerns, and – maybe most importantly – our empathies and solidarities relate to lives, things, places and events that seem peripheral to our being here. Margaret Boyce is a PhD student in the English and Culture Studies department at McMaster University. Her research interests include film studies, Indigenous incarceration, neocolonialism, Critical Animal studies and risk / security society. As a lifelong resident of Hamilton, Ontario, on Mississauga, Algonquin and Haudenosaunee traditional territory, Margaret is generally interested in reading, thinking, and writing strategies that work in, through and around colonial, colonizing and anthropocentric ideals. She is currently developing a dissertation examining Canada’s promotion of Inuit art, especially in the lead-up to the nation’s sesquicentennial, as a form of colonial recognition politics. Next Next post: What Lives On?